Cool and crisp, the thought of linen conjures up images of white sandy beaches, blue waters, and soaring palm trees. Because of its cooling qualities, linen is the textile of choice during the summer – particularly when jetting off to tropical locations. If however, you can’t live in perpetual vacation and must join the rest of us in reality, there is a way to wear linen all year around. A Rolex with a linen dial is an elegant way to wear a daily luxury watch and here we have three awesome examples to look at. Rolex Datejust 16030 with a linen dial and jubilee bracelet. 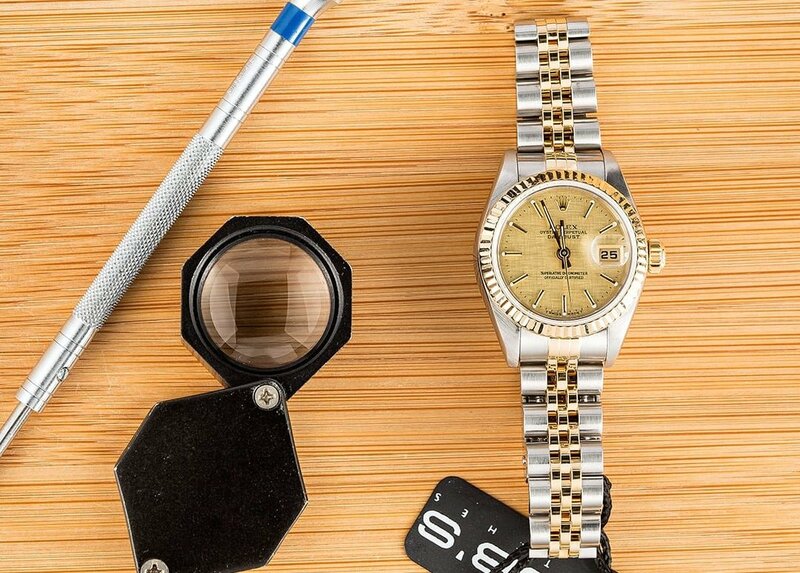 Dating from 1981, this Rolex Datejust 16030 has everything you want in an elegant timepiece. The full stainless steel construction, 36mm Oyster case, engine-turned bezel, and Jubilee bracelet come together for a watch that’s effortless chic. This particular Datejust’s relaxed, yet sophisticated vibe is further enhanced by the textured linen dial. The flecks of gray on the dial match the sleek steel metal impeccably and adds depth to the face of the watch. Powering the Datejust ref. 16030 is the famed Rolex Caliber 3035 automatic mechanical movement, thus it boasts the quickset date function. Attractive, reliable, and luxurious, you can’t ask for more from a daily companion. This particular Datejust’s relaxed, yet sophisticated vibe is further enhanced by the textured linen dial. For a Rolex watch with a date window that’s smaller than the Datejust, there’s the Date 1500. With an Oyster case that’s sized at 34mm, it’s a perfect Rolex for someone with smaller wrists. This vintage Rolex Date 1500 may hail from the early 1970s, but as with most Rolexes, it’s perfectly relevant to wear today. Built in stainless steel, topped with a smooth bezel, and marked with baton indexes, this ref. 1500 sports a look that will never go out of style. Also, the linen dial is perfectly at home within the case and it flawless complements the gray suede strap. 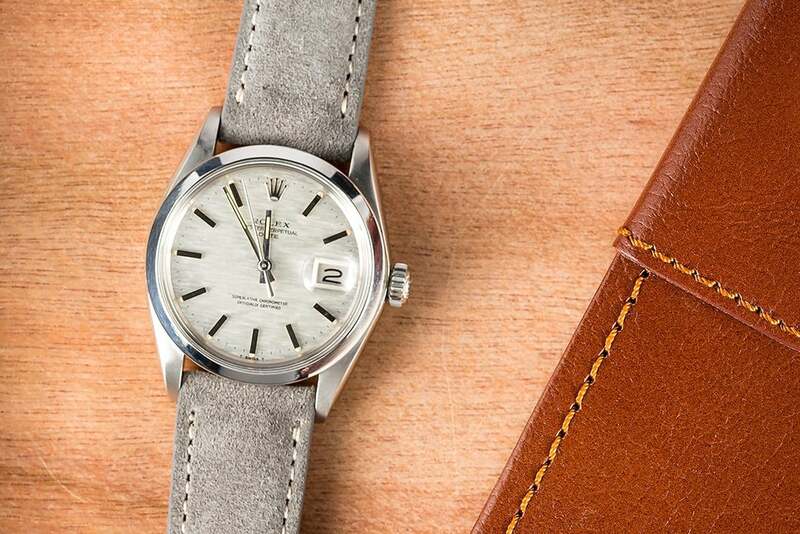 A vintage Rolex that is oh so casually cool. 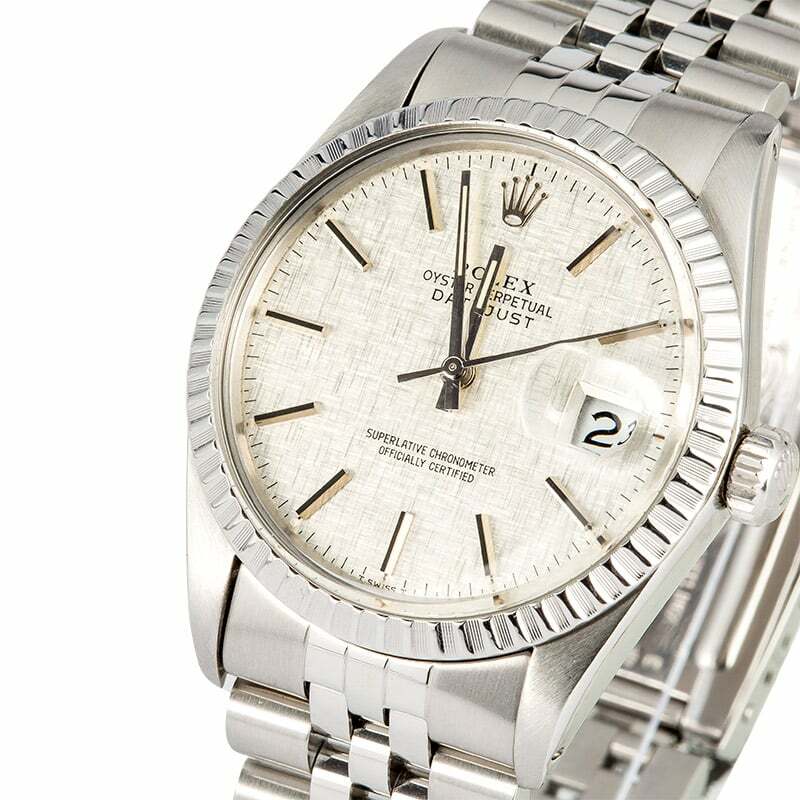 For a Rolex watch with a date window that’s smaller than the Datejust, there’s the Date 1500. The standard in ladies’ dress watches, the Rolex Lady-Datejust is a classic choice. Especially in a two-tone version with a Jubilee bracelet and fluted bezel. It doesn’t get much more iconic than this model in the world of women’s luxury watches. This Lady-Datejust ref. 79173 carries all the characteristic hallmarks, but also offers an interesting touch with its champagne linen dial – a great accent to the 18k gold found on the watch. The Oyster case of the Datejust 79173 is sized at a feminine 26mm and can easily be worn anywhere, anytime. 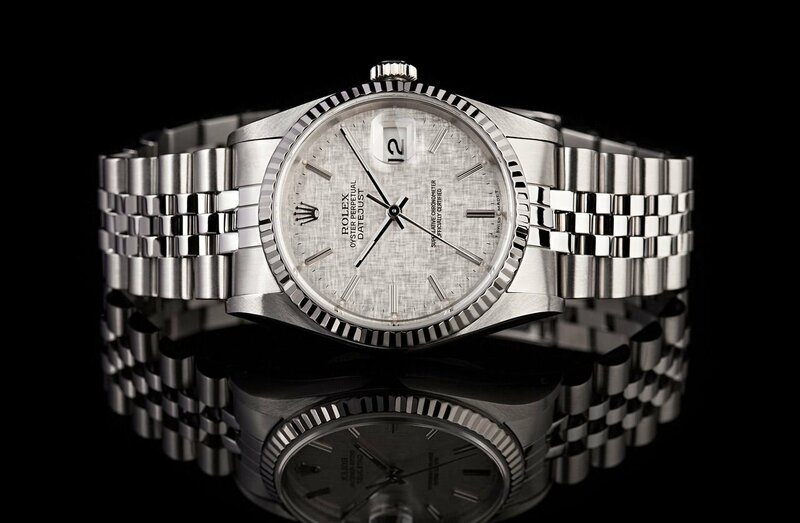 Aside from its beauty, the Lady-Datejust is also robust thanks to the scratchpad sapphire crystal, Twinlock winding crown, water resistance to 330 feet (100 meters), and Rolex Caliber 2235 automatic movement. Rolex Lady-Datejust 79173 with a linen dial on a Jubilee bracelet.